I grew up experimenting in the kitchen. We would gather around the kitchen and just create different dishes that appealed to us. We were always a veggie heavy family and I remember that the fridge always had to be stocked a few times a week to keep up with the demand. One favorite, and most requested dish were zucchini chips which are super easy, relatively healthy and definitely always gobbled up in a flash. It’s no wonder why when food is put out, I always feel like I need to take it quick or there won’t be any left because growing up that’s how it was you snooze or come late to the dinner table then oh well sorry no more left haha. Some things don’t really change. 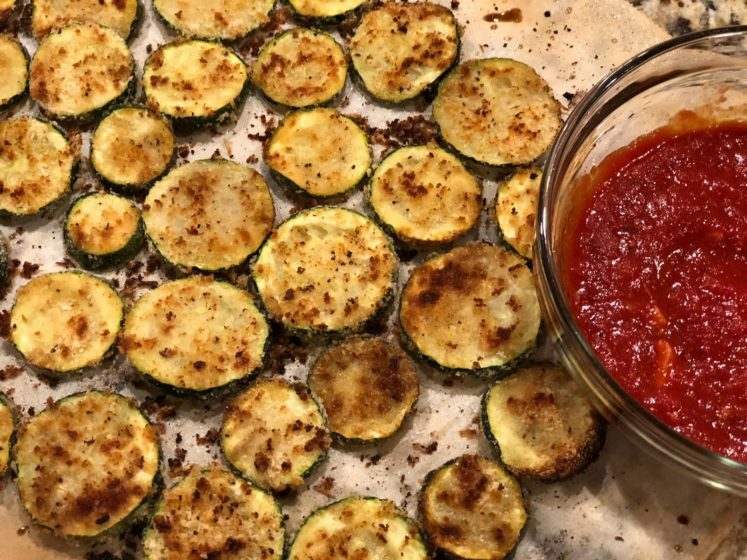 I’m now making these zucchini chips for my family and it’s still pretty much the same they are devoured by my kids before I even have a chance to put them down. So maybe it’s not because there wasn’t enough, I think it’s because they are that good!! I hope you like them as much as I did growing up and as much as my kids do now! Dredge the zucchini in egg. In a separate bowl or a bag put about 3/4 cup bread crumb 3/4 cup Panko. add 1/2 tsp garlic powder, Mix. Dredge the egged zucchini in crumbs and lay it out in a single layer on a sheet pan (or 2) with parchment sprayed with cooking spray. Drizzle olive oil or spray with cooking spray and bake for 375 degrees for about 15 minutes on each side flipping half way through until browned and cooked through. In a saucepan add the olive oil allow to heat up a bit then add the chopped garlic until lightly browned then add in the tomato sauce. Add Salt and pepper to taste and serve with the zucchini chips.